Aniket Choudhary, a youngster working as a Prime Minister Rural Development Fellow in Jammu & Kashmir for the last two years has won the contest for suggesting best ideas for Narendra Modi's pet 'Ek Bharat Shreshtha Bharat' project that aims at cultural connect between states. Choudhary suggested introduction of new chapters from Class 5 in schools highlighting cultural aspects of other states and storytelling competitions about leaders of other states. 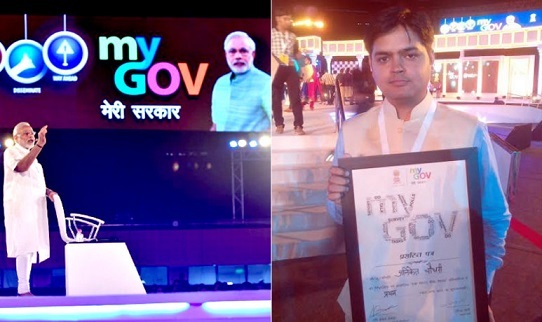 "Ek Bharat Shreshtha Bharat" contest was organized on MyGov, Government of India’s citizen-engagement platform, from 5th November 2015 to 25th December 2015. Citizens were invited to submit their ideas and suggestions on structuring the programme so as to encapsulate its true spirit in all its various dimensions and capture the diversity that characterises India. Aniket Choudhary from Jammu and Kashmir was adjudged the winner while Shashi Kumar Kulkarni from Pune and Tushar Khatri from New Delhi were adjudged second and third respectively. Aniket Choudhary was awarded with Rs. 1 Lakh cash prize and certificate on 6th August by PM Narendra Modi.